Partial views are similar in concept to normal views with the main difference that they can be embedded inside views. As an example, we will create a page that, for the currently logged user, displays the billing and the shipping address allowing the user to edit them. We will continue the solution build in the previous posts, that you can download from Codeplex. Or, if you prefer, you can download directly the source code for the current post using this link. First we will create a new table to store the addresses and we will modify the users table to have two references to the Addresses table, one for the billing and one for the shipping address. And we will display the address in read-only or edit mode depending on the current value for the model property: @Model.IsReadOnly. Next we will create a controller called UserControlsController and a view called PartialViewExample that will display the name and surname of the currently logged user plus the shipping and billing addresses using the new partial view we just created. The model item passed into the dictionary is of type ‘HelloWorld.Code.DataAccess.User’, but this dictionary requires a model item of type ‘HelloWorld.Code.DataAccess.Address’. If you run now the code, you will see that the address partial view was inserted twice in the view. In practice views are great when updating content via Ajax requests, and this is what we are going to do next. When the user clicks on Edit we will replace the read-only text of the address with the edit-enabled version of the address partial view. On the server side, we need a new controller action method that returns the HTML for the partial view when the user clicks on ‘Edit’. 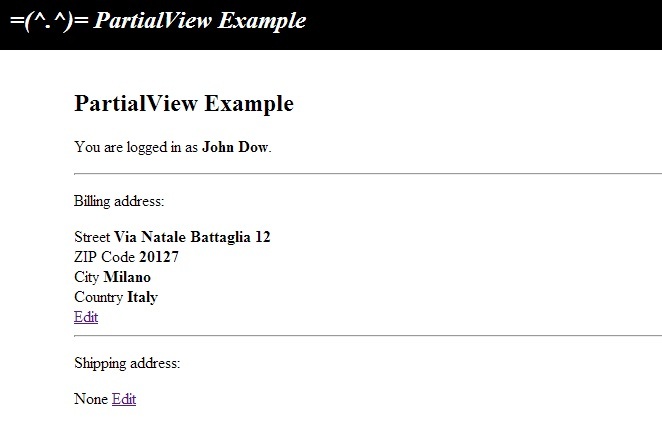 The method that renders the partial view is PartialView. We use it to generate the HTML markup only for the AddressPartialView so we can return it to our Ajax caller that will update the HTML content only for that partial view. This is it. If you want to download the complete example you can find it here on Codeplex. A common way of including dynamically generated HTML markup inside a view is by using the methods defined in the HtmlHelper class. This class contains helper classes that can be used to generate basic HTML elements like text boxes, text areas and check boxes. Apart from the default implementation we can write our own custom helper methods. I explained in detail how this can be done in another post: Custom HtmlHelper for filtering the input in a text box. 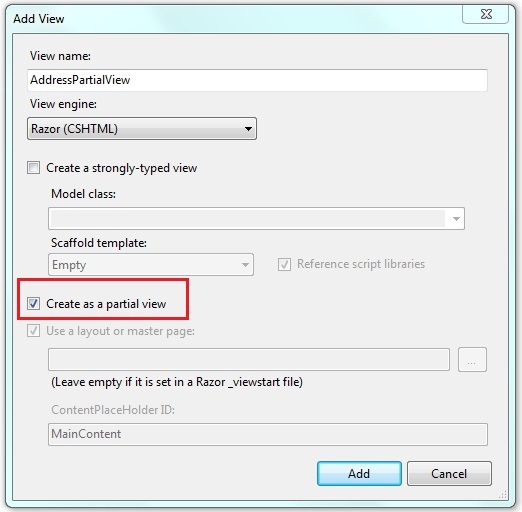 For a comprehensive tutorial check this link: MSDN: Walkthrough: Using Templated Helpers to Display Data in ASP.NET MVC. Again, very nice post. Congratulations! Why not use an HtmlHelper custom function to do a strong typed Partial? something like @Html.Partial(“View”,Model) ? Thus you may even be able to validate the type of the model based on the declaration in the view. If I’d try to pass to the partial view a different type of model, our good friend Resharper, would signal the problem immediately. Anyway, I agree with you, it would be easier to write a custom HtmlHelper extension for rendering the partial view that, when passing null @Html.CustomPartial(“PartialView”, null) would not use the model of the current view but would actually use null. Hi Mightymada, thanks for the post is just what I was looking for, btw do u have this latest changes?